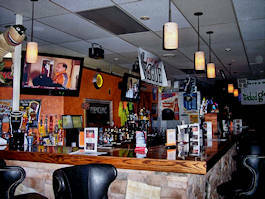 The Wicked Googly is a full service restaurant and great neighborhood bar and showplace. We stock the areas largest selection of domestic and imported beers. We always have 20 craft & domestic beers on tap and they change regularly. We feature live entertainment Wednesday through Saturday and have a Karaoke DJ on Sundays. We are located inside Ligonier Lanes, so bowling is always a great option. Try with flashing colored lights and fluorescent pins! Our restaurant menu, an up-to-date entertainment schedule and daily specials are available on this site. Stop in for breakfast starting at 7am daily. Today's happenings are always available on this page over in the right column. We feature 20 beers on tap and a large selection of bottled beers. See the most current list here. This site is now mobile friendly and is still a work in progress, so keep checking back for additional features and information. See our current Draft & Bottled Beer List!